One person's beauty mark is another person's mole. So it is, I think, with “freckles” on tomatoes. My first experience with this trait was with seed I got in trade of the variety Scabitha, which was attributed to Brad Gates at Wild Boar Farms. I was impressed. The fruit was meaty and tasty and the skin had random gold flecks that were interesting and unique. One of the plants from this seed appeared to be an outcross, with smaller heart shaped fruit and a different expression of the “freckles” trait. I made a cross to the true-to-type Scabitha, and saved OP seed from the odd ball. Next year the odd ball got odder, and the first F1 showed that the “freckles” were heritable, and partially dominant. Again I saved seed of the oddest of the oddballs (Freckled Strawberry) and made more crosses. In the meantime I started trying to learn more about this unusual trait. Here’s what I think is going on. Fruit pox and Gold Fleck are physiological disorders that are often found together but are considered separate conditions (reference here). Fruit Pox is described as small cuticular disruptions found at random on the fruit surface. The number can vary from a few to many. Gold Fleck shows up as small irregular shaped dark green spots at random on the surface of immature fruit which turn to a gold color as fruit ripens. Number of spots can vary from few to many. There are reported genetic differences in susceptibility to these conditions (see here), and Scabitha and some of my lines seem genetically predestined to Pox and Gold Fleck – hence the “freckled” phenotype. Here’s a photo showing the Gold Fleck phenotype on immature green fruit and on a mature red fruit. In my various Freckled Strawberry lines the green fruit stage is heavily peppered with black dots, which will later turn gold. Although high expression of the pox phenotype is a little over the top, moderate freckling in the F1/F2's look interesting. There does not appear to be any relationship between "freckles" and any important horticultural traits (e.g yield, taste or fruit texture). A few other observations: the “freckled” phenotype is influenced by environment, with higher expression later in the season; one F2 plant appears to have pox, without gold fleck – so maybe these conditions are somewhat independent; and there are other freckled phenotypes that are probably not related (e.g. WBF Freckled Child). 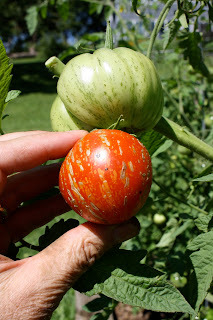 An August 2011 update: in a new “freckles” breeding line I was able to find a plant with fruit that had gold fleck (freckles) and without fruit pox (scabs). Interestingly in this fruit the freckles seemed to align in a fashion that suggested lateral “stripes” of gold spots. 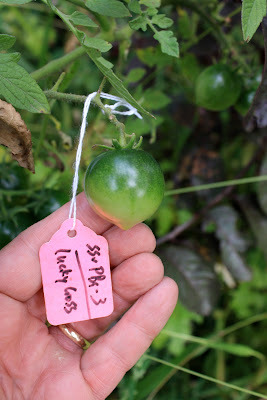 I crossed this plant to a darker skinned/fleshed tomato hoping for gold on dark purple. That’s a combination you can’t do with the gs (green stripe) gene – see the breeding for stripes blog entry. Also this year we found an unusual variation on the freckled phenotype in a F3 plant from the cross Scabitha x Boar's Hoof -freckles w/o pox, but the freckles are tan, not gold. Jessica (the plant pathologist) thinks this project is a dry hole, and wants nothing to do with it. Mark is intrigued … but on his own on this one. For now Mark, ever the optimist, is avoiding using the term pox, in favor of “freckles”. More to come as Freckled Strawberry is stabilized and several Scabitha or Freckled Strawberry F2’s get planted out this spring. Sept 2013 update - We have been able to introgress Aft (anthocyanin fruit) into our Freckled Strawberry germplasm. The desired effect was gold freckles on a indigo skin (like bright stars on a night sky). This is a work in progress, but looking interesting. 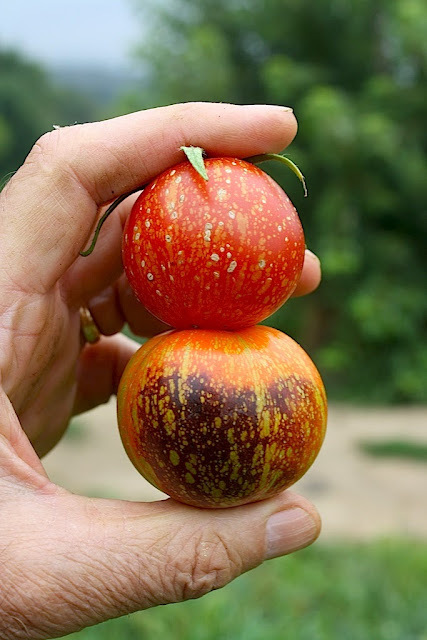 In this photo there are two fruits from the same plant, one fully ripe from deep in the canopy (no direct sun, no anthocyanin) and one from the top of the plant (below in photo) showing anthocyanin accumulation on the side of the ripening fruit exposed to the sun. We like the look of these, but they are not yet stable. The photo below was taken at our NC breeding nursery in July 2014. Two plants in a row of a hundred showed this very striking gold freckles on indigo. There are several online sites that cover basic techniques for crossing and seed saving, and we've learned from all of them. One of the best on crossing is here. Here's a photo of Mark's crossing tool box: scissors for trimming back to a single flower, and when necessary for trimming petals during emasculation; a set of very sharp forecepts - the primary emasculation tool; colored wire ties to help you find the emasculated flowers the next day; a glass lens from a discarded pair of sunglasses, on which to collect and apply pollen; and some brightly colored tags to label the crossed flowers after pollination is complete. I also use reading glasses to better see what the heck I'm doing. I've had best success emasculating after work on day 1, and pollinating the following day after work. This allows emasculation of very young un-opened flowers, and pollinating 24 hrs later when they are more mature (and receptive). I very rarely get any accidental self pollination with this method. Some hints on timing of pollination - I like at least 24 hrs of dry weather after pollination to make sure rain doesn't wash off the applied pollen, and I have most success when I pollinate early in the season (e.g. June), before it gets too hot. The problem with early pollination is that you haven't had a chance to fully phenotype the parents yet (if they are from a segregating population). I usually extract seed from the ripe fruit in the field (saving messing up the kitchen) and plop the seed and pulp right into a ziplock bag, labeled with a water proof sharpie. After fermentation in the basement for a few days, I wash the seed, dry and store in a coin envelope. The cultivated tomato is a self-pollinated plant. With few exceptions, the stigma (female) remains within the anther cone (male) until after pollination, greatly limiting potential cross-pollination. It is estimated that >95% of the seed in tomatoes is normally the result of self-pollination. Multiple generations of selfing inevitably result in a single allele being fixed at each genetic locus - each gene/locus is homozygous for a particular allele. Inbred lines are stable from generation to generation (i.e true breeding). Thus the progeny from saved seed from an inbred line or OP (open pollinated) tomato variety will look just like the female parent. A progeny plant not identical to the female parent is likely the result of chance cross pollination, facilitated by one of various pollinating bees frequenting most gardens. 1) OP (selfed) seed is harvested from a commercial F1 tomato hybrid (e.g. SunGold F1). The F2 progeny will segregate for all traits that were different between the two parents. Usually the identity of the parents is proprietary to the breeder/seed company. Several generations of selfing/selection may create an OP population that looks something like the F1 hybrid – but no guarantee. 2) A plant tracing to a chance outcross is identified in OP progeny from an heirloom/OP variety (e.g. Brandywine). Again the F2 will segregate. In this example you know the female, but not the male parent. There is a high degree of luck required to pull something useful out of a chance outcross. However there are some sterling examples of success: Lucky Cross, Berkeley Tie Dye, Earl’s Faux …. 3) A breeder plans a cross between two parents that compliment each other in some way - for example an early, small fruited, high yielding and disease resistant line crossed with a late, large fruited, lower yielding, and very tasty variety (e.g. SunSugar x Lucky Cross). From the segregating F2 – F6 generation progeny the breeder selects the plants that best combine the desirable traits from each parent. A F1 cross between two inbred parents is very uniform, and no selection is possible. The maximum genetic variation is expressed in the F2 generation, and it is important to have as many F2 progeny as possible to maximize the opportunity to capture the desired characteristics from each of the two parents. With each succeeding generation there is less genetic variation, and population size can be smaller. By the F6 generation selected lines should be pretty stable and true breeding. A F1 cross between non-inbred parents, for example the double cross (AxB) X (CxD) or three way cross (AxB) x C, will segregate in the F1 generation, so selection within multiple F1 progeny is often desired - subsequent filial generations can be handled as described above. Some important traits are controlled by many genes (e.g. yield and taste). These are called quantitative traits and heritability is complex. 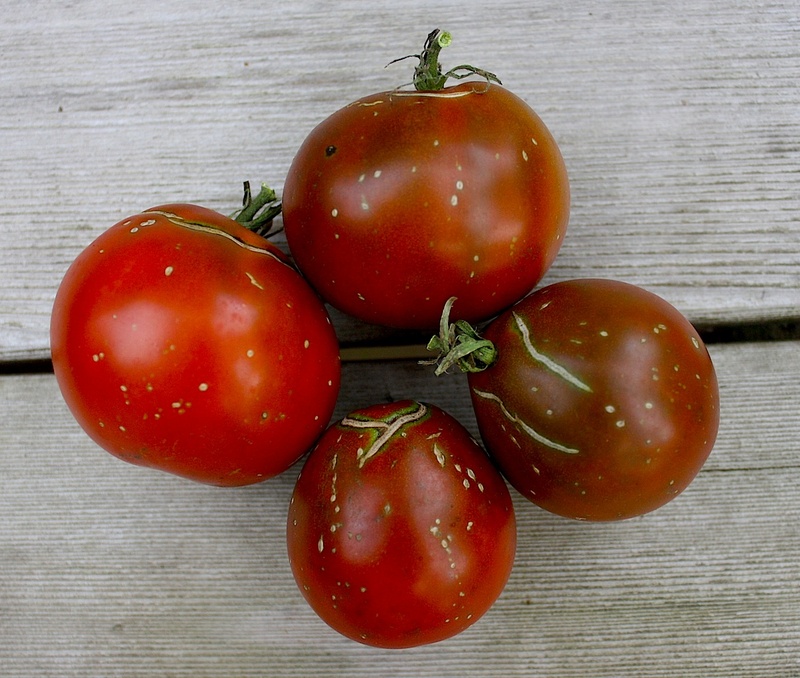 Many important traits in tomato are controlled by single genes. 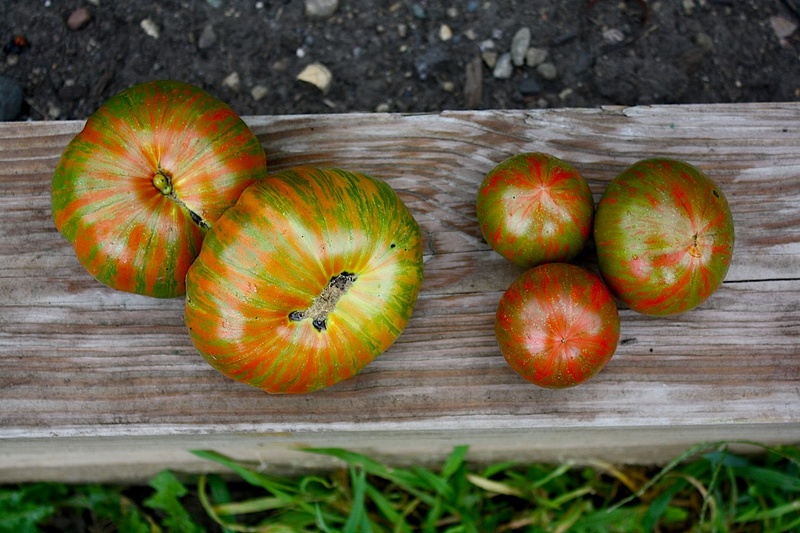 A good summary of common tomato genes and their alleles can be found here. A recessive allele is only expressed in the homozygous condition (e.g. gs/gs = homozygous for green stripe). A plant showing a recessive phenotype will be true breeding for that trait in subsequent generations. A homozygous dominant can only be indentified by progeny testing (i.e. evaluating the phenotype of numerous progeny). When all the progeny have the dominant phenotype, the parent can be assumed to be homozygous for the dominant allele. A successful tomato breeding program will generally require careful selection of parents for new crosses, evaluation of enough F2 plants to find the desired combination of traits from the parents, and active observation/notes and selection in each of the segregating generations. Our experience is that few crosses will yield an end product that is truly unique and special; plant breeding is both an art and a science; and there’s an element of luck and unpredictability that make it fun. One final note – this is something everyone can do in their own garden, no matter how small. Create something new, involve your kids, teach them a little about genetics and plant science. If you are looking for starting materials, or want to learn about the experience of others, check out one or both of two great tomato on-line forums: Tomatoville and The Tomato Depot. 2014 update: the above breeding outline describes a typical breeding program for O.P. (open pollinated) varieties. A breeding program for F1 hybrids would include all of the above elements plus evaluating O.P./inbred lines for suitability as a potential parent in one or more new F1 hybrids. This final step will normally require many dozen test crosses, evaluation of lines for parent traits (i.e. suitability for being a female or male parent), and careful consideration of combining parents with complimentary attributes. As discussed in a recent post on this site (link), F1 hybrids increase complexity in both breeding and seed production, but have intrinsic advantages vs. O.P varieties in many situations. Tomato breeding is big business. A few of the big multi- national seed companies have large tomato breeding programs, as do a number of more specialized tomato/vegetable seed companies (U.S., Europe, Asia and Israel) and a few public universities. Their focus has been on tomatoes specifically designed for three markets: processing tomatoes for sauce, paste, catsup, etc. ; "green and gassed" tomatoes that are picked green for shipping, then gassed with ethylene near their end destination to "ripen" (these are the typical grocery store and food service tomatoes that look OK, but taste like wet newspaper); and the vine ripened cluster, grape and cherry market grown in mild climates or greenhouses and shipped to grocery stores (e.g. produced in Mexico and shipped to the U.S. year round). 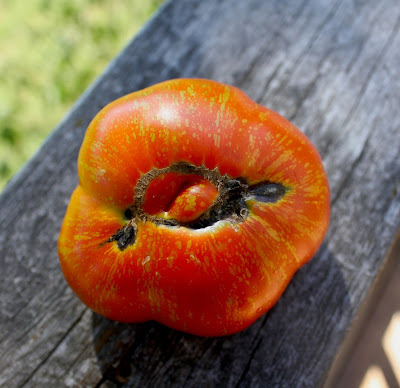 The market that is largely ignored by this industrial breeding effort is the fresh market tomato, picked when ripe, and either eaten by the producer (you and me) or sold at local markets, restaurants, etc. That's the niche we, and a handful of other talented small scale breeder/producers, are targeting. 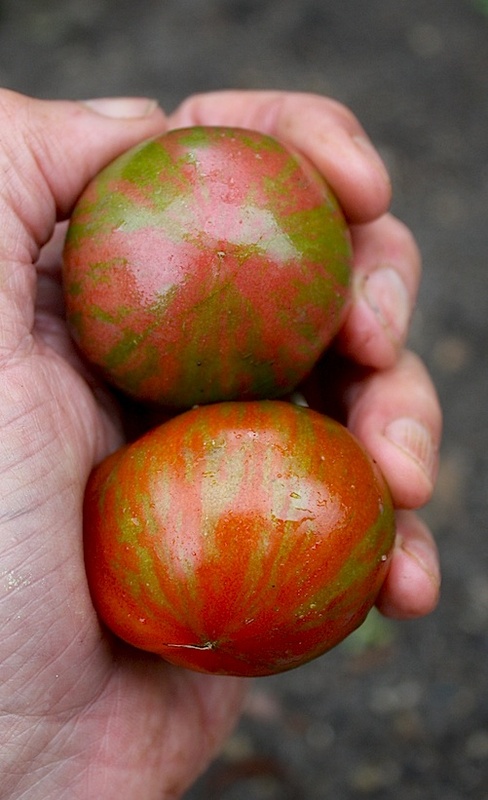 If there's a common theme to these small breeding programs it's tomatoes that taste great and look interesting (check out the Wild Boar Farms site).